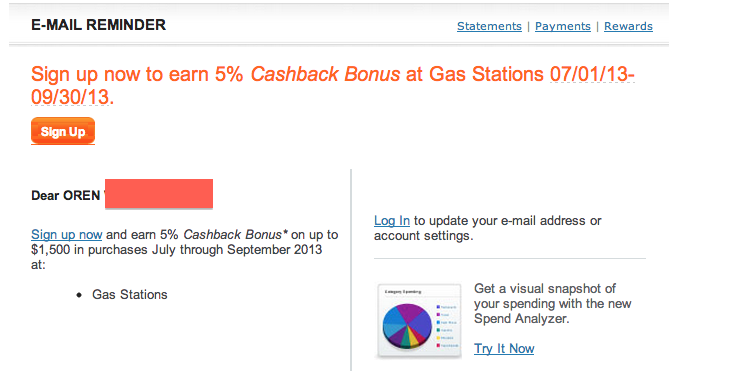 The beginning of enrollment for the various 5% credit cards for Quarter 3 has come. Here are the stats. All of the cards are for purchases from the beginning of July until the end of September. 5% Cashback at Gas stations, Theme parks and Kohl's on up to $1,500 in purchases (up to $75 cashback). Find a gas station that sells gift cards in the convenience store coded as a gas station to get 5% off gas for the full $1,500. For those who live in Buffalo, there is a Sunoco like this. 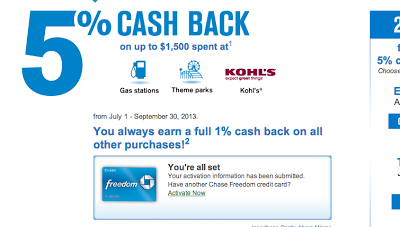 Same as Chase Freedom, but if you find $500 visa gift cards at Kohl's and use the full $1,500 use the Discover for gas.